GSMArena team, 20 January, 2016. Last week the LG V10 proved its camera as one of the best, so we will include it in the camera comparisons today, even though LG's smartphone is not part of this comparison. Note that it's there just as a reference and will not take part in the scoring. We'll start off with a field-of-view comparison as it has an impact on both the image quality and how you compose a shot. 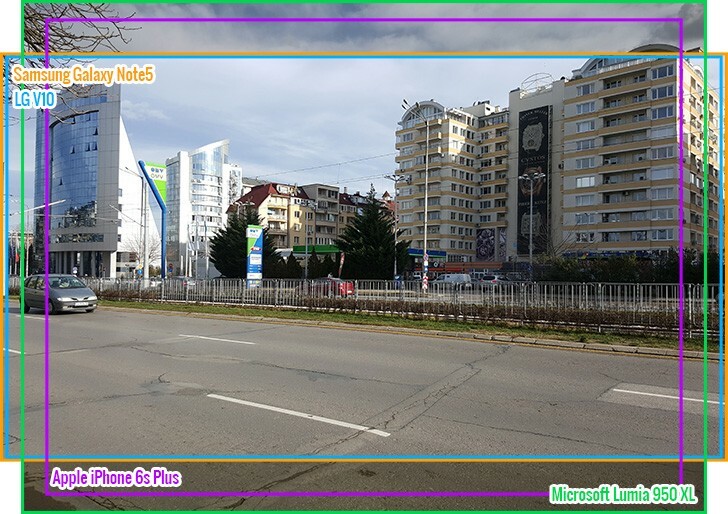 The Microsoft Lumia 950 XL was set to 4:3 mode (because it's the aspect that captures the highest resolution photos) and it's still very wide - almost as wide as the widescreen LG V10 and Samsung Galaxy Note5. The V10 and the Galaxy Note5 both have the same field of view, it's the 4:3 Apple iPhone 6s Plus that is the narrowest, but not by a huge margin. We'll put the Note5 and V10, which you should already be familiar with, on the left and the new iPhone 6s Plus and Lumia 950 XL on the right. The iPhone shows very good dynamic range while the Lumia lost some detail in the shadows. Both South Korean phones overexposed the brightest sunlit areas. Color rendering has some flaws. 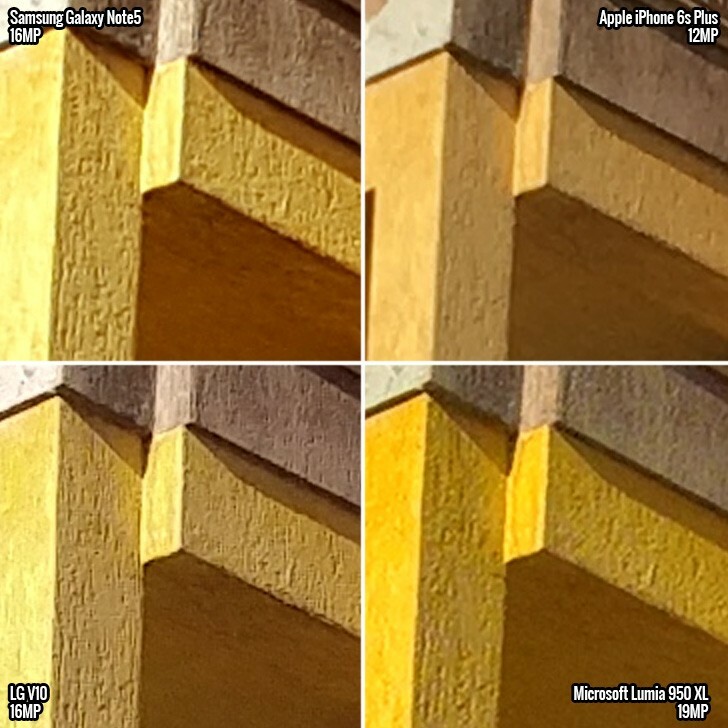 The Apple phablet lacks contrast in the red channel, making things look flat while the Microsoft camera showed a very noticeable yellow tint. The iPhone 6s Plus is behind on resolution but handles it very well. The noise is higher than in Note5 and Lumia photos. The LG V10 has a more noisy output than those. 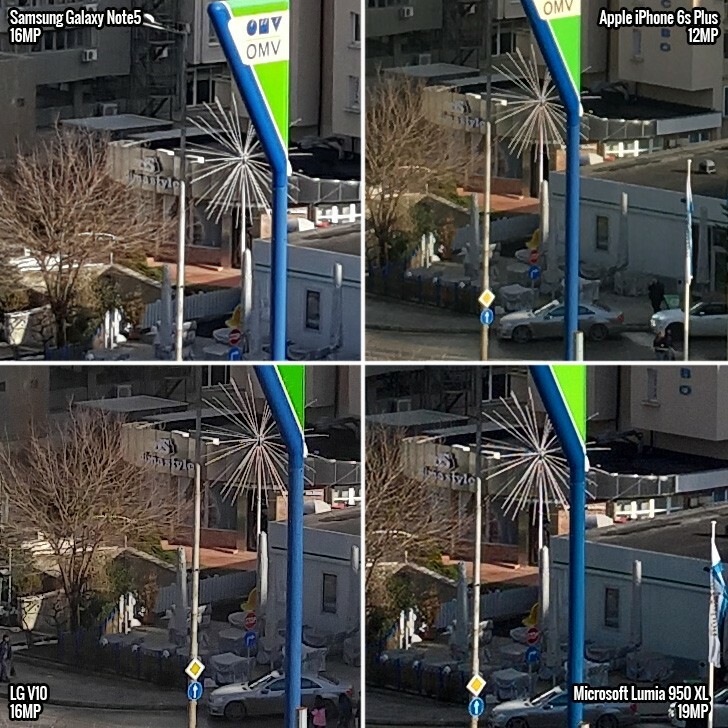 Resolved detail is close to what the Lumia achieves (despite the resolution difference, helped a bit by the narrowed FoV). The approach to image processing is laid-back - there is no big contrast boost, strong noise reduction or much sharpening. This makes for a comparably softer output, but that's easily fixable if it gets in the way. The Lumia 950 XL enjoys a similarly laid-back image processing, but it pushes the contrast setting a bit too hard and the colors seem to be oversaturated. This (along with the yellow tint) makes the photos appear like they've been processed by a trendy filter. The LG V10 leaves some noise before the sharpening stage, and if you look closely, you'll notice some of the detail is artificially added (artifacts from the sharpening, such as the horizontal streaks). The Note5 processing takes out almost all of the noise but loses some detail in the process. 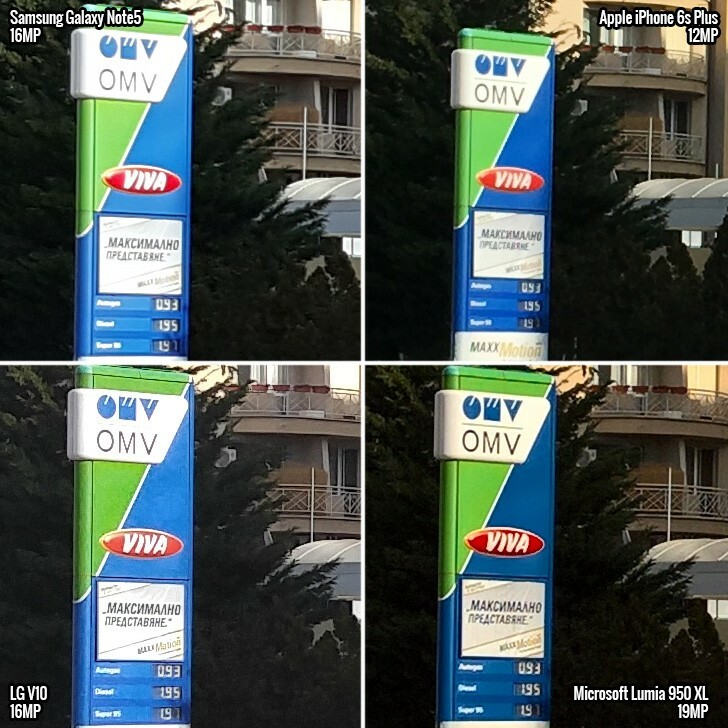 The iPhone suffers from this the most because its 12MP camera has less information to work with from the start, but the Lumia loses a lot of detail as well. Note: the crop below is at 200% zoom. While the iPhone 6s Plus performs admirably, there are some places where its lower resolution limits what it can do. Look at the branches of the tree - they are thin, and the camera has troubles resolving them. Of course, part of that is the balance between noise reduction/sharpening. The branches look much sharper in the V10 shot than in the Note5 or Lumia 950 XL shots. Winner: Samsung Galaxy Note5. Photos look noise-free and fairly rich in detail, colors are accurate. The dynamic range limits detail in the highlights and noise reduction strips away some good detail. Runner-up: Microsoft Lumia 950 XL. Image processing is less refined than that of the Galaxy, but its high resolution gives it a running start. Images can look like they went through an Instagram filter, though. Third place: Apple iPhone 6s Plus. Good processing can't hide the resolution disadvantage. Very good dynamic range and great white balance but the iPhone 6s family are no longer an image quality benchmark. With iPhone 6s Plus Apple abandoned the 720p selfie camera that previous generations used and put in a 5MP/1080p shooter, which can also do slow motion - 120fps at 720p. So, all four phones advertise 5MP cameras, though the LG V10 has two of them (one 80° and one 120°). For resolution the Galaxy Note5 has a slight advantage with its 1440p mode (i.e. QHD), it even boasts f/1.9 aperture. The Microsoft Lumia 950 XL just can't help itself and pumps up the contrast and saturation again, but it produces some of the most eye-pleasing selfies of the bunch. The Apple iPhone 6s Plus camera had much more realistic colors and managed to keep more detail in the shot. The LG V10 has a slight edge in sharpness over the iPhone, but colors are quite pale and undersaturated. The Galaxy Note5 loses a lot of detail to noise reduction (just like the main camera), so it left us disappointed. Winner: Microsoft Lumia 950 XL. The colors may be slightly off, but these are hands-down the most eye-pleasing selfies on this side of the 8MP barrier. Runner-up: Apple iPhone 6s Plus. It's the natural colors and processing that doesn't eliminate fine detail that secures the iPhone a close second place. Third place: Samsung Galaxy Note5. The camera is so afraid of noise it smooths out even actual detail on the skin. The images remain fairly sharp, but the most important part of it looks so smooth that it as if it's been arificially enhanced.